I hope I'm not jinxing anything by posting a day early, but so far, October has been pretty good, money-wise. My funds are finally back up to where they were before the little hiccough a few months ago, and although I spent more than I was hoping to again this month, I was able to spend $200 less than last month, which is a good thing. I have a few friends doing a "no spend November" and while I won't be going quite that far, I'm hoping to reign things in a bit more again. I'm still going back and paying down the categories that I'd refreshed once or twice, which still show up as red in my "all time" view on Mint.com's budgets. In October, I cleared out my health and fitness budget ($27) and my shopping budget ($617), and started slowly working on my food budget (I put in an extra $111 this month). 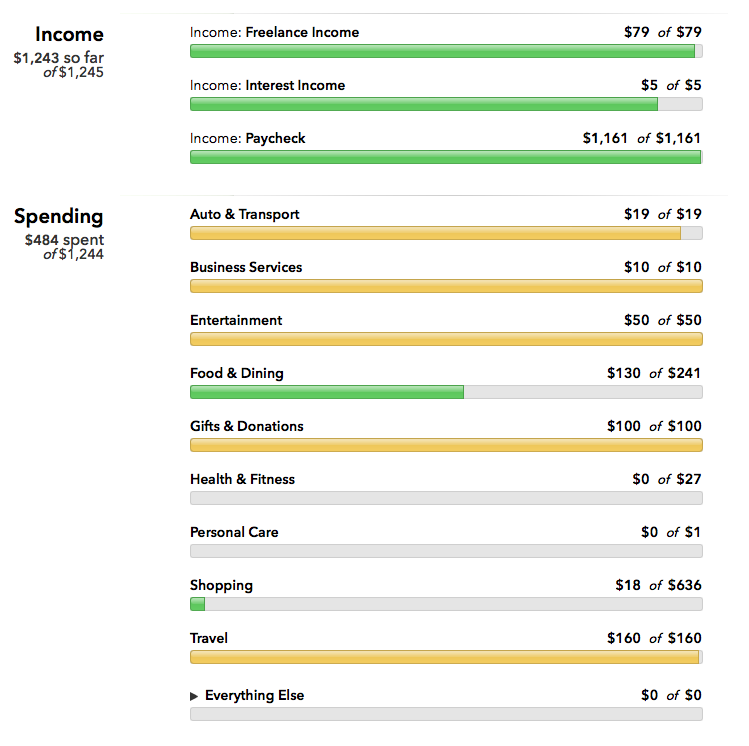 For the next few months, I'll be working on what's left: food ($1880), and "home," which is actually what "cash from the ATM" used to be filed under, and which was also mostly spent on food ($4,927). It's felt great to get some of these cleared up and know that I'll be able to really start fresh with an emergency fund and travel fund. In November, I'll be back on the $300 cash budget. I have a few showers I'll need to travel for and get gifts for, along with a trip home for Thanksgiving, but I think I should be able to do it without too much trouble if I'm more conscientious about my lunch spending. We're also certainly going to buy our tickets to India, but we've already agreed to use credit card points for that, so that will be a fun new adventure. I don't think any of my freelance income will come in until December, but that's alright. We'll get there!